I teach full time, and school vacation is a chance for my workspace to get messy. It's gotten so messy, in fact, that this is a folding table next to my usual (and very small) workspace. 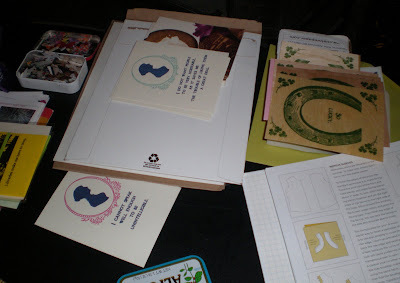 You can see my two latest card designs inspired by Jane Austen, along with postcards for my friend (and fellow Boston Handmade member) Kris' Etsy shop Relaxation works. Underneath are some envelopes containing gorgeous work from a Gocco swap I participated in. To the right is my experiment of Gocco printing on wood veneer stationery, which came out well. Underneath that is a sewing book I'm using for a personal project that's gone horribly wrong. To the left is an Altoid tin full of butterfly die cuts waiting to be recycled into stickers and some library cards that are part of an order waiting to be shipped out. How do I sum this up? I'm never bored, that's for sure.